When a vehicle has features that are beneficial to the driving experience, it makes the choice easier when they are compared to other vehicles. Most vehicles have at least a few features that drivers can rally around, but the vehicles that make sure every feature is something that most drivers will enjoy are ahead of the game. The team at BMW has accomplished this with the X5. 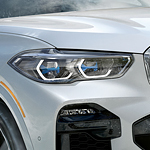 There are so many features to examine in the BMW X5 that one day at BMW of Rochester Hills doesn't seem long enough to go through them. The positive drive begins before you enter the vehicle with models equipped with Comfort Access. As you approach your vehicle this feature begins to unlock the vehicle and illuminate welcome carpet that shines next to the door. Including the remote start, means your vehicle will be ready to go once seated. To provide a different view as you drive around Shelby Township, the BMW X5 comes with a Panoramic Moonroof. This feature provides a view from many angles of the night and daytime sky.